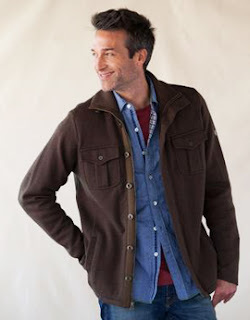 Casual is always cool and that means comfortable utility jackets or wool sweaters this winter. While this usually means you have to pick one or the other, Kühl designed one of the best sweaters for men seen this year. They also took care of everything some people hate about sweaters. There is no itch. There is no pullover. There is no neckline. All in all, the spy sweater by Kühl looks like a jacket that zips and buttons, but is functional like a sweater because it has all the comfort and none of the bulk. It's also made with Merino wool, which is the finest and softest wool you can buy. It's the same wool manufacturers choose for athletic wear because it's excellent at regulating body temperature and drawing moisture away from the skin. The high collar is ribbed. The design, including tight weaves, is part of Kühl. So are some of the other clothing technologies, like using recycled coffee grounds in select knit fabrics and organic cottons without pesticides and fertilizers. Specific to the sweater, Kühl used double-plated boiled wool. The company is serious about all of its choices. Kühl Clothing is mountain born in America. Merino wool was once so sought after that Spain made exporting Merinos punishable by death. Today, Merinos are more common, but only because King Ferdinand VI of Spain sent some to his cousin in Saxony in the 1700s. It didn't take long for the colder-climate Germans to cross them with Saxon sheep, making the wool even denser, finer, and softer. Although Kühl conjures images of Germans and European mountaintops, the company was born in the Wasatch Mountains of Utah. Kevin Boyle, like most of the people who work there, is an avid skier, rock climber, and mountaineer. As avid outsdoorsmen and environmentalists, it's no surprise that Kühl is passionate about freedom, civil liberties, and the environment. They are also avid supporters of the High Road for Human Rights. And, although unrelated, recently redesigned a 1972 unimog into a bio-diesel Kühlmog. An alternative jacket for colder climates from Kühl. The spy sweater was easily a winter pick for me. If you want something heavier or a layered look with the same smart styling, the alpenwurx by Kühl marries classic fleece with a vintage twist. While I'm not personally fond of Berber fleece, it would work exceptionally well with this jacket. You might also notice the shoulders and elbows look like suede leather at a glance. The material is actually a sueded micro fiber fabric. But the real tell in the quality of Kühl clothing is that they use precision Swiss Riri zippers, seriously some of the best zippers made. And Riri is known for innovation and environmental respect. Kühl also makes several jackets for women too. 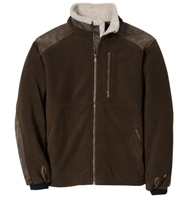 The standout among them is the Kühl compass flight Jacket, which combines motorcycle lines with an ultra-soft fleece. It looks like wool, but in this case Kühl opted for a poly micro fiber and polyester blend. You would never know the difference. The Spy Sweater By Kühl Warms Up 7.8 On The Liquid Hip Richter Scale. The spy sweater by Kühl is perfect for someone living in a climate like Southern California. Winters are never that cold here. However, the sweater is still great for layering in colder climates, without adding too much bulk. Some people have said they typically unzip after they warm up their core temperature. Yeah, I can feel that. You can find the spy sweater at Sundance (about $158) as an exclusive online offer. It comes in three colors: brown, black, and olive. Kühl also offers a smoke grey sweater on their site, but no longer lists olive. The prices are about the same. You can also find it on Amazon, but it is only available in black.